I got my third block done on my Dear Jane. C9 Jane's Tears, I did some reverse applique and did not take long. I have added a Dear Jane page to my blog. You can see what I am planning. To see more Design walls check out Judy's Patchwork Times. I have been working on using up my Pink scraps for the Rainbow Scrap Challenge 2013. January is Pink. Wow I did lots. I have a few more days to finish up my Pineapple log cabin blocks and I may do a few more sprout blocks. You can see my three little Dear Jane blocks on the top left. Then under them is the butterflies. Next are four heart blocks that measure 8" and two Crumb blocks that measure 6". Under that is the sprout blocks. Then 44 spools made using Bonnie Hunters challenge for Leaders and enders. On the Far right is four Pineapple log cabin blocks. Two are done and two still need a few more strips. Under the spools are 16 patches. Under the Pineapples is a block I am going to call 'Around About', I plan to add around and around it with each of the rainbow colours we work though. Oh my, Jane's Tears block is beautiful! Pretty little Dear Jane block. You really have lots going on in your pinks. I bet you really like pink, huh?? They all look great! Love all your pinks! But what are you going to do with them all? I wouldn't have had any until this month when I did a new Valentine top. Now I have a million! wow, that is whole lot of pink. I especially love the sprout blocks, will be interesting to see where you go with those...what are the size of your blocks - 3"? Love it that you have all your projects mapped out on the design wall like that. Well done with the pinks, I look forward to what you do with February. 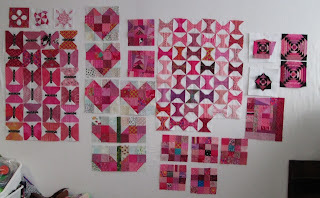 Wow - such an assortment of wonderful pink blocks! It's going to be fun watching everything evolve as the year progresses! Your Dear Jane block is lovely! 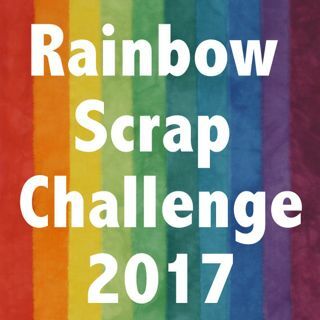 I love what you have going on with the Rainbow Scrap Challenge. 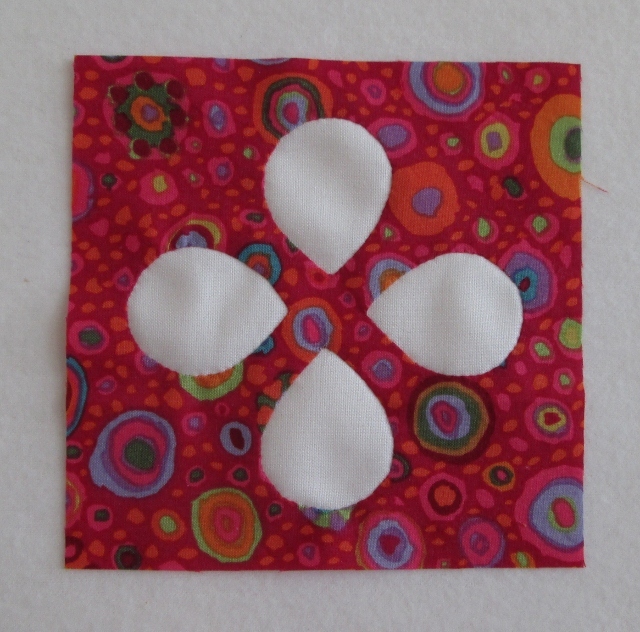 I have some reverse applique that needs to be done on a block, I'm nervous! Is it really hard? Is there a resource you recommend? Wow, you have been so busy. I look forward to seeing your Dear Jane grow.